SMART's XR-DIMM small form factor DDR3 memory module designed for ruggedized embedded computing applications. 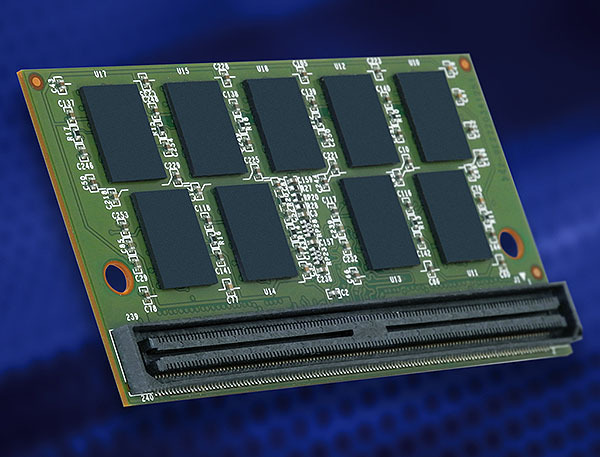 The new XR-DIMM offers improved power, reliability and signal integrity. NEWARK, CA--(Marketwired - Jan 22, 2014) - SMART Modular Technologies, Inc., a leading independent designer, manufacturer and supplier of value added subsystems including memory modules, flash memory cards and other solid state storage products, today announced its new XR-DIMM small form factor DDR3 module, specifically designed for ruggedized single board computing (SBC) applications requiring high reliability, density and performance attributes. The 240-pin module conforms to standards established by the Small Form Factor Special Interest Group (SFF-SIG) to provide a perfect-fit solution for telecom, networking and industrial computing applications. SMART's DDR3-1600 XR-DIMM is offered in 2GB, 4GB and 8GB densities with ECC. Other options offered include low power and industrial temperature operation. The XR-DIMM is just part of a wide family of DDR3 small form factor module solutions that SMART supports. SMART will be showcasing its new XR-DIMM along with its entire line of memory solutions at the Embedded World Exhibition & Conference in Nuremburg, Germany starting on February 25, 2014 in Hall 4, Stand 4-360. For more information please visit www.smartm.com/media/events.asp. SMART Modular is a technology leader in the design, development and deployment of current and next-generation memory and storage products. Combining leading-edge design and manufacturing with proven world-class support, SMART Modular leverages its deep expertise in DRAM, SRAM and Flash architectures, with world-class board-layout design. SMART Modular delivers high-quality, high-reliability solutions to a broad customer base, including tier one computing and telecom OEMs as well as industrial, medical and automotive customers. In support of these designs, SMART Modular provides award-winning innovations in memory and embedded storage technologies. SMART Modular is part of the SMART family of global companies. See www.smartm.com for more information. The SMART family of companies are leading designers, manufacturers and suppliers of electronic subsystems for the most demanding OEMs around the world. The SMART companies have led the way over the past 25 years providing standard and custom products to today's leading global OEMs crossing all major electronic industries. These industries include PC, enterprise and industrial servers, networking, telecom, defense, aerospace, gaming and embedded application markets. Taking innovations from the design stage through manufacturing and delivery, SMART Modular Technologies has developed a comprehensive product line that includes DRAM, SRAM, and Flash memory in various form factors. SMART High Reliability Solutions offers high-performance, high-capacity solid state drives ("SSDs") for defense, aerospace and industrial automation markets. SMART's presence in the U.S., Europe, Asia and Latin America enables it to provide its customers with proven expertise in international logistics, asset management and supply-chain management worldwide. See www.smartm.com for more information.